This article is about the religious organization. For the temple in Mournhold, see Mournhold Temple. The Tribunal Temple was the native religion of the Dunmer of Morrowind. 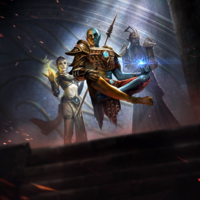 They worshipped Almalexia, Sotha Sil, and Vivec, known together as the Tribunal or Almsivi. Most people usually just call it "the Temple". They accept outlanders as members, but most of the few outlanders that do join, join only for the services provided. The main Temple cities on mainland Morrowind are Almalexia, Sotha Sil and the Necropolis Necrom. On Vvardenfell, the Temple District included the city of Vivec, the fortress of Ghostgate, and all sacred and profane sites (including those Blighted areas inside the Ghostfence) and all unsettled and wilderness areas, as the Treaty of the Armistice with the Empire maintained the island as a Temple preserve. In practice, this district included all parts of Vvardenfell not claimed as Redoran, Hlaalu, or Telvanni Districts. The Temple maintained less than favorable relations with most of the Imperial guilds of Morrowind. However, it maintained strong relations with the pious House Indoril and House Redoran, and was friendly with House Dres and House Hlaalu. When the Tribunal fell apart, the Tribunal Temple underwent a reformation, becoming the New Temple. The Temple was an organization created for the worship of the Tribunal. The three demigods Vivec, Almalexia and Sotha Sil joined their powers to set up the Ghostfence, a magical boundary around Red Mountain on the island of Vvardenfell, to contain the spread of the Blight plague. The history of the Tribunal goes back to the War of the First Council, after which the then mortal Almsivi exploited Kagrenac's Tools to make themselves gods. Of the Great Houses of Morrowind, House Indoril was the one most deeply rooted in the Temple hierarchy, dominating both the priest caste as well as the Ordinators who serve as guardians of the Temple. House Redoran is one of the most pious houses; Redoran Buoyant Armigers serve together with Ordinators as guardians of the Ghostfence and the Tribunal Temples. House Hlaalu, being dominated by Imperialised Dunmer, prays when it is convenient, maintaining the appearance of piety through lavishly-appointed structures. House Telvanni has little use for the Tribunal Temple, as the Magelords themselves are as ancient as the Almsivi, letting its temples become overrun with dust and squatter merchants. House Dres, being the most traditional of the Great Houses, supports the Temple when it is convenient for their slave trade. Tribunal Temples were scattered all around Vvardenfell and most served as return points for Almsivi Intervention spells. While many of the temples in outlying areas were freestanding structures built of packed mud in the Redoran style, it was not uncommon to see them adapted blend in with local styles, be that built on top of Vivec's cantons, or even integrated into Telvanni mushroom structures. There were two Fanes on Vvardenfell: the High Fane on Vivec's Temple Canton, which housed the offices of the Archcanon and Temple administration, and the fortress-city of Ghostgate. The latter was the larger of the two structures, with a wizard's tower forming each wing, but both featured an elevated central platform which held an offering pit and one of each type of shrine. After the disappearance of the Tribunes and the devastation of the Red Year, the Temple - and, indeed, the Dunmer - entered a period of soul-searching and reorganization, much of which is lost to history. Ultimately, as predicted by Vivec, the "New Temple" returned to the original Dunmer faith -- "the worship of our ancestors and the three good daedra, Azura, Mephala and Boethiah", and the Tribunes were ultimately demoted to the still-venerated roles of "saints and heroes" to help ease the transition. The New Temple worships the three good daedra as "The Reclamations". For more information, see the Morrowind Tribunal Temple article. ^ Vivec's conversations with the Nerevarine. ^ Elder Othreloth's dialogue in Dragonborn. This page was last modified on 15 December 2018, at 19:24.